Liverpool goalkeeper Alisson has made a superb start to life in the Premier League, even if he had a bit of a nightmare in the team’s last game at Leicester City. The Brazil international shone at Roma and was seen as a hugely exciting signing by Liverpool this summer, and it’s fair to say it’s gone well for him so far. 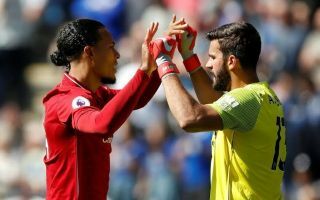 As well as some fine saves at big moments, Alisson is also a quality player with his feet, and is therefore ideal to what Jurgen Klopp wants from his side. The 25-year-old’s style did lead to him overplaying a bit to concede a goal against Leicester in the Reds’ last game, but luckily for him it didn’t cost them the three points on that occasion. The stats now seem to support the fact that Alisson really is a top performer when it comes to playing out from the back, which LFC fans will be pleased to see. As this picture below shows, Alisson tops all other Premier League goalkeepers this season for long ball accuracy, and for passing accuracy overall. Is the Liverpool goalkeeper the signing of the summer?